This recipe is another delicious one from our new Williams-Sonoma cook book, titled “Entertaining”. With a few minor tweaks and additions, we effortlessly made this dish our own. We wanted to present another “gourmet” meal as inspiration for sticking to clean eating, without sacrificing flavor or presentation. 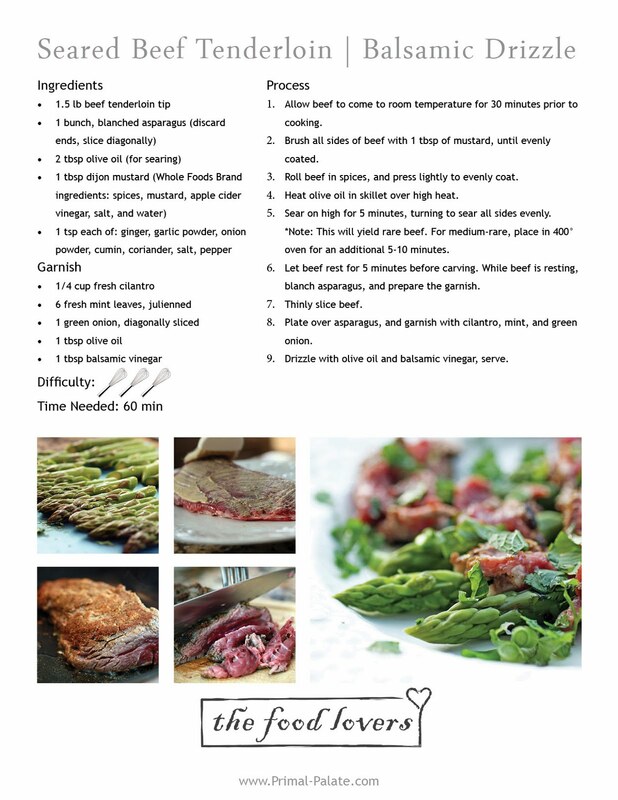 This recipe fits all the criteria of the Paleo 30 Day Challenge, and yet is a dish that we would serve many times over to house guests. This dish, although calling for a ‘prime’ piece of beef, has flavorings that can be utilized on virtually any cut of beef with great success. The Dijon mustard has two purposes in the recipe: it provides adhesion for the dry spices, and also contributes additional flavor that really makes this dish come to life. Though this dish would typically be served rare, you can continue cooking the beef in the oven if you have an aversion to very rare meat. Allow beef to come to room temperature for 30 minutes prior to cooking. Brush all sides of beef with 1 tbsp of mustard, until evenly coated. Roll beef in spices, and press lightly to evenly coat. Heat olive oil in skillet over high heat. Sear on high for 5 minutes*, turning to sear all sides evenly. *Note: This will yield rare beef. For medium-rare, place in 400° oven for an additional 5-10 minutes. Let beef rest for 5 minutes before carving. While beef is resting, blanch asparagus, and prepare the garnish. 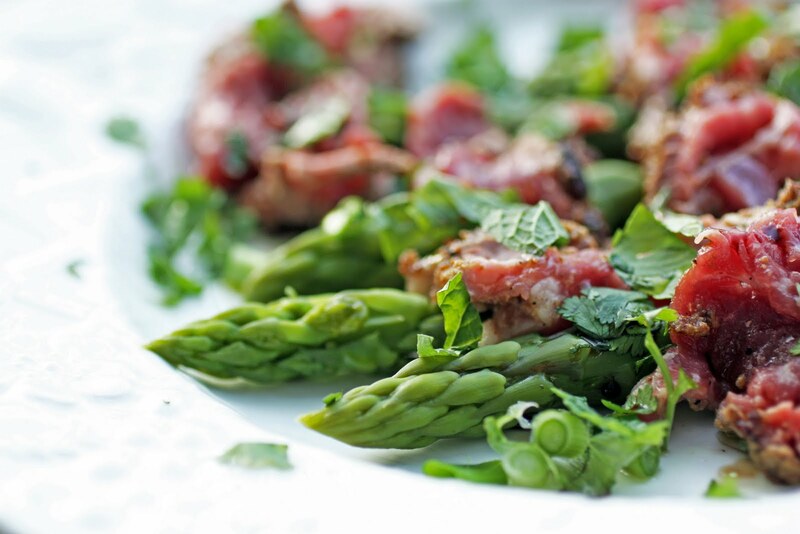 Plate over asparagus, and garnish with cilantro, mint, and green onion. Drizzle with olive oil and balsamic vinegar, serve. The cilantro and mint bring about a freshness to this recipe that compliments the deep, complex flavors of the seasoned filet. To complete the meal we accompanied the filet with the light flavor and crisp texture of blanched asparagus. This meal will be sure to impress any loved one or guest, no matter the occasion. I like using mustard on my meats too. The beef looks cooked to perfection and delicious.